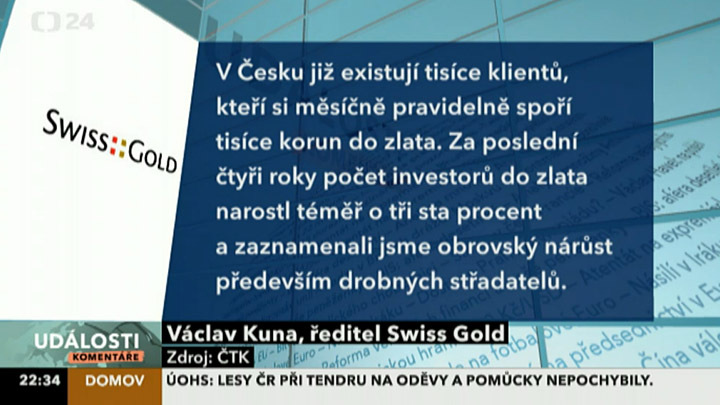 People in the Czech Republic invested in gold nearly double the sum of money compared to last year. It results from the analyzes of companies specialized in investments in gold. The investments in gold have increased by hundreds of millions this year, especially thanks to the efforts of many Czechs secure their savings against depreciation. The price of gold, unlike other commodities or shares, increases significantly in times of economic crisis, about tens of percent a year. Other comments of CEO Swiss Gold were published: ČTK, Hospodářské noviny.